From Saturday, October 21, 2017 to Sunday, October 29, 2017, the Russian Club in Hong Kong is delighted to invite YOU to the 1st Russian Culture Week “Русская Осень” in Hong Kong. Taste, Feel, Hear, Discover the Russian Culture by joining a week-long program of events encompassing film, performance, discussions, networking, cultural workshops and cooking classes. From traditional market to the Russian music concert, this week of events will showcase Hong Kong Russian-speaking community. Our culture and creative identity is embodied in its visual arts, history and language. The cultural pride is derived from sharing its values, beliefs, identity and self-expression with one another and Hong Kong people as a whole. During the week, you will meet Russian artists, designers, vendors, chefs, who live and work in Hong Kong for several years. Galleries will be hosting Russian art and photograph exhibitions. Among other events Russian Club will be organizing two special events, the highlight of which will be a joint Gala Dinner with From Russia With Art. We deeply believe that the Russian Culture Week will bring our peoples a little bit closer and tight the bonds of friendship between both cultures. 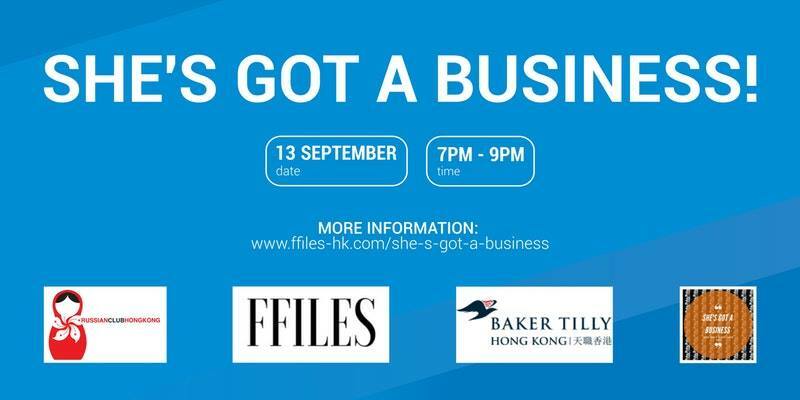 FFILES consultancy started the “She’s Got a Business!” series with the idea to inspire and educate women like you and me about what it takes to start and run a business. These interviews met with great success and this September, with the support of Russian Club and Baker Tilly Hong Kong we are going live! After 2 successful practical events dedicated to starting and fundraising your business we are organizing our first panel event with successful female entrepreneurs. They will share their experience of finding “the” idea, starting their business and challenges they had to overcome to run their business in Hong Kong. The goal of the event is to inspire, educate and connect more female entrepreneurs. Meet with like-minded people, ask questions and exchange new ideas. Venue: IQ BAR (Winner Building, 27-39 D’Aguilar St, Central).